Help the patient move position in bed, adjuvant patient turning over, carrying the patient and ect. Medical Transport,Healthcare Bed Transferring,Daily Living and Home Care Mobility Devices. Shifter for elderly paralyzed patients. Transfer pad assisted lateral recumbent care. Seniors with poor ability to walk and ect. Moving position on bed from one point to another. Patient transport from one bed to another. NOTE: Two or three caregivers are needed to move the patient, only one caregiver can not move the patient. Lightweight Double-layer terylene transfer belt has a 220 lb. Weight capacity and is durable enough for frequent reuse. Polyester Fabric little hard makes it durable,1.5 inch-wide terylene webbing, reinforced stitching at handles,ease positioning and transfer safety. 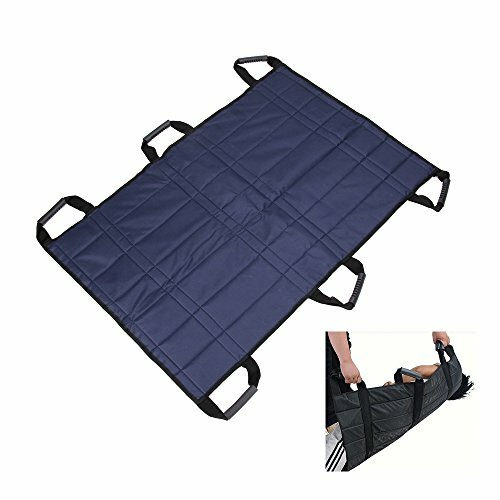 Simple and easy to use turner pad for transferring patient from the bed to the another bed or chair, But also easy to flip the paralyzed patient's body, help him wipe the body, relax the muscles, making his back skin can breathe fresh air does not decay. Transport board belt for Medical Transport,Healthcare Bed Transferring,Daily Living and Home Care Mobility Devices, Fit Elderly, Bariatric Patient, Disabled, Handicap. If you have any questions about this product by NEPPT, contact us by completing and submitting the form below. If you are looking for a specif part number, please include it with your message. SafetySure MovEase - 34" x 36"